We are proud to share your stories with our Medical School community in Class Notes. 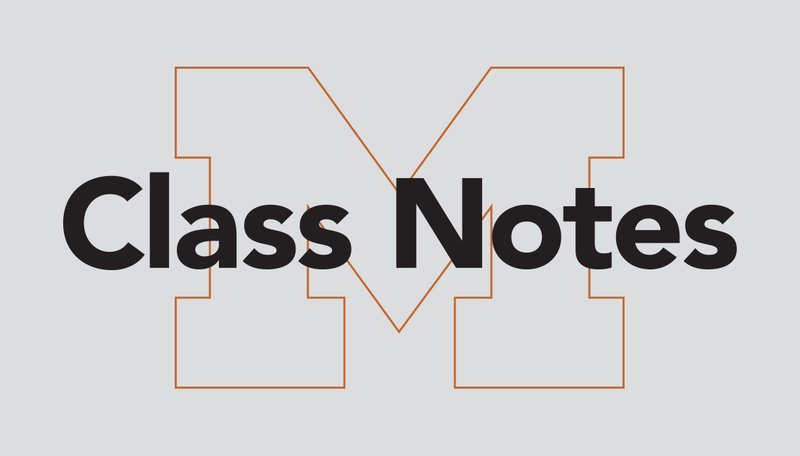 Submit your alumni news for Class Notes to lmcrawfo@umich.edu. Alexander B. Baxter (M.D. 1985), assistant professor of radiology at the New York University School of Medicine, published Emergency Imaging: A Practical Guide, 2015, Thieme. Robert A. Hoogstra (M.D. 1984) recently accepted the position of associate medical director of quality at Mercy Health Hospital in Muskegon, Michigan. Hoogstra, an emergency medicine practitioner, is also president of West Michigan Emergency Services. Katrina Rosculet (M.D. 1987, Fellowship 1992) recently accepted the position of assistant clinical professor of ethics and professionalism at the Medical College of Wisconsin, Green Bay, which opened in July 2015. Rosculet also serves as an ethics consultant to multiple hospitals in the Fox Valley, Wisconsin, area. Janellen Smith, M.D. (Residency 1986), was elected president of the Pacific Dermatologic Association for 2016. Smith is currently a professor of dermatology specializing in melanoma at the University of California, Irvine School of Medicine. John Deledda (M.D. 1999) accepted the positions of chairman of the Department of Emergency Medicine and director of the Emergency Medicine Service Line at the Henry Ford Health System in Detroit. Brian Donley (M.D. 1990, Residency 1995) was named chief of staff of the Cleveland Clinic Hospital in August 2014. In January 2014, Donley became president of the eight Cleveland Clinic community hospitals and 16 family health centers throughout northeast Ohio. He also maintains his role as professor of surgery in the Lerner College of Medicine. Louito Edje (M.D. 1995) was elected the youngest President Elect of the Medical Center Alumni Society. Edje, who spoke at the 2015 U-M White Coat Ceremony, is currently enrolled in a Master of Health Professions Education program at the Medical School. William Carman Baum (M.D. 1942) died June 6. Baum practiced urological surgery in Grand Rapids and Holland, Michigan. Lloyd Berry (M.D. 1952) died Feb. 13 in Dallas, Texas. Berry was a family practice physician in San Antonio, Texas, for over 54 years. Charles Berwald (M.D. 1963) died in Layton, Utah, on April 28. Berwald was a family practitioner before retiring in 2012. Bradford M. Blanchard, M.D. (Residency 1959), passed away on June 30. Blanchard practiced medicine for 48 years at Hartford Hospital in Connecticut. Robert Bonfield (M.D. 1964, Residency 1968) passed away on Aug. 4 in Ann Arbor. Bonfield was a radiologist at St. Joseph Mercy Hospital in Ann Arbor. James Clark (M.D. 1950) died March 4. Clark was a physician in Fennville, Michigan, before establishing Medical Pathfinders, Inc. in the 1970s. Max Garber (M.D. 1951) died Feb. 20 in Ann Arbor. Garber practiced pediatric medicine in Canton and Farmington, Michigan, for 40 years. Ruben M. Lopez (M.D. 1991) passed away June 5. Lopez was the trauma medical director at Valley Baptist Medical Center in Harlingen, Texas. John Magielski (M.D. 1945, Residency 1949) passed away on Feb. 22 in Ann Arbor. Magielski practiced otolaryngology at St. Joseph Mercy Hospital in Ann Arbor. David H. Saxe (M.D. 1937) passed away on Dec. 13, 2014, at the age of 101. Saxe was a clinical professor of surgery at New York University. Joseph Smith (M.D. 1961) died Aug. 2. Smith was a radiologist at Walter Reed Army Hospital in Washington, D.C. and at the VA Medical Center in Manchester, New Hampshire. Calvin B. Ernst (M.D. 1959, Residency 1965) died in Lexington, Kentucky, on July 7. Ernst served as a professor of surgery at U-M from 1979 to 1997. William Cooper Stebbins, Ph.D., died April 24 in Ann Arbor. Stebbins was a professor emeritus of otorhinolaryngology at the Medical School and professor emeritus of psychology at the College of Literature, Science and the Arts.